Ann Craig - distINKtive STAMPING designs - Stampin' Up!® Australia: Stampin' Up! 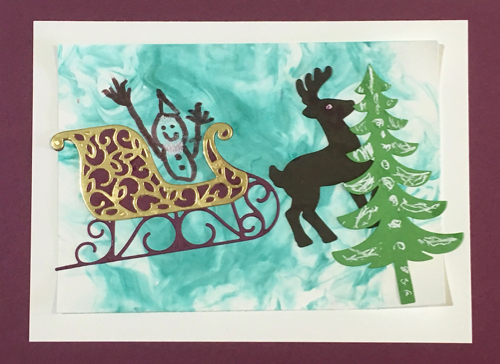 Santa's Sleigh Bundle Christmas Card. Stampin' Up! Santa's Sleigh Bundle Christmas Card. Christmas cards are always fun to make and as it gets closer to Christmas I am looking for some quick cards to share with my customers. Santa's Sleigh bundle from Stampin' Up!, consisting of 15 stamps in the set and 10 different Thinlits is ideal to use and appeals to all crafters - young and old. My grand daughter who has just turned 5 had a lot of fun creating this picture for me. First she made the background using the shaving foam technique. She cut the sleigh, tree and reindeer using the Big Shot and glued them down. She added a hand drawn Santa (having a wonderful ride) and drew snow on the tree using a white gel pen. I really enjoy children's art! Getting back to the simple cards, this one is inspired by a card by a demonstrator from the USA, Michelle Reynolds. 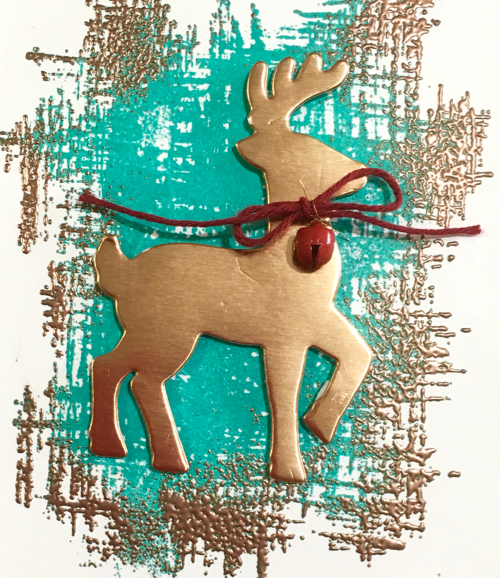 It uses the die cut reindeer cut in Copper Foil displayed over a background stamp from Stampin' Up! 's "You've Got This" stamp set. The background is created using the Rock 'n' Roll technique, inking the stamp first with Bermuda Bay then rolling the edges with Versa Mark, prior to sprinkling copper embossing powder over the image. 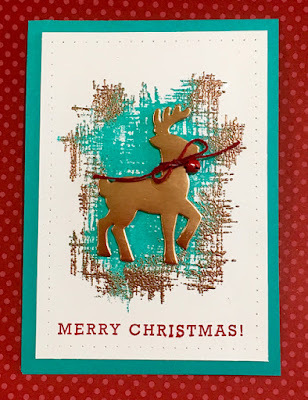 Heat set the copper embossing powder and you have some extra sparkle on the card. I added a little extra detail with some faux stitching holes and matted the card front onto a Bermuda Bay card base. I hope this gives you some ideas for quick Christmas Cards. If you like the idea of creating lots of these, just imagine them in all different colours, and using both the Silver and Gold Foil and Embossing Powders for variations.